The next 10 players to feature include the World’s best player, a few Ajax legends, England’s first entry and the odd Brazilian here and there. For numbers 50-41, click HERE. Well Andy, the reason people dwell on that goal is because a left footed player took a penalty in the final of the World Cup with just five minutes left, on his right foot. That is ballsy. In reality, Brehme was pretty much both footed, he took free kicks on his left foot and the odd penalty on his right. That’s all well and good, but to do it on the biggest stage to win the game is something else completely. There’s a big game temperament and then there’s showing off. Even Ibrahimovic would think twice before trying a stunt like that. His other two big stage goals were at the semi final stage of both the 1986 World Cup and then four years later against England in Italia ’90 – both were free kicks on his left foot. He scored 8 goals for his country (pretty good for a left back), five of which were in either the World Cup or Euros. Quite simply, he was a big game player. Strange as it may seem, there were still question marks over whether or not Messi was the best player in the World as recently as 2009. They said that Ronaldo could do everything Messi could but could score headers as well. Then in May 2009, Messi scored his first Champions League final goal – a back post header that was expertly directed back across goal and over van der Sar. The arguments stopped pretty soon after that. The dominant force in the recent history of the Champions League, Barcelona have won titles in 2006, 2009 and 2011, with Messi also scoring in the 2011 final, as well as two semi final goals against Real Madrid. Sure, he hasn’t quite been as devastating with his national team, but a recent hat trick against Brazil has hinted at a change there as well. To date, his biggest goal for Argentina was in the semi final of the 2007 Copa America. There’s still a lot of time to go though. If Messi has been the most consistent scorer in high profile Champions League games of the past few years, then Jari Litmanen was his equivalent in the mid 90s. A winner with Ajax in 1995, the diminutive forward scored two in the semi’s that year. He went a step further a year later, repeating a semi double but also notching in the final against Juventus which won him the Golden Boot. Ajax lost it on penalties though Litmanen did score his. In 1997 he scored once again in the semi’s but it wasn’t enough to take the Amsterdam club to their third successive final, and brought to an end a great team. He went on to play for Barcelona and Liverpool, and is the only player to play international football in four different decades, with the 90s being the high point. When you have the nicknames “God of Soccer” and “The White Pele” then you know you’re a pretty good player. In fact Pele himself once said “throughout the years, the one player that came closest to me was Zico” which was both pretty arrogant but also not really worth much based on some of his previous quotes (“God gave Freddy Adu the gift to play soccer” – really?). Either way, Zico was the mutt’s nuts. The heartbeat of the 1982 side thought to be the best team never to win the tournament, he was prolific from midfield, scoring 52 goals for Brazil in just 72 games. He bagged four in the 1982 World Cup alone, but as Brazil didn’t get past the Quarter Final (damn you Paolo Rossi! ), his only national team goal to make the list was in the Final Group stages of the 1978 World Cup where he scored against Peru. The rest of his entries were down to his biggest success as a player – the 1981 Copa Libertadores. In the first leg of the final, Zico scored a double against Cobreloa of Chile to give Flamengo a 2-1 lead. The second leg ended 1-0 to the Chileans, meaning a one off final was to be played in a neutral venue (Uruguay). Once again Zico scored two goals, this time without reply, to win the trophy for the Brazilians and finish the tournament on 11 goals. Known as “Johan the Second”, Neeskens played alongside Cruyff for Ajax, Barcelona, and Holland. Initially a right back in his early Ajax days, Neeskens matured into a centre midfielder of high work rate which was equalled by his ability. A regular scorer from deep, Neeskens could be counted on for the big occasion. He scored the third goal in the 1971 European Cup semi final against Atletico Madrid as Ajax went on to win the trophy for the first time. For his country, he also delivered on the big stage, scoring in the 1974 Final Group Stage against East Germany on the way to a 2-0 win before facing Brazil in what was effectively the semi final. Neeskens put Holland 1-0 up in the 50th minute before Johan the First finished off the World Champions. In the Final, Neeskens continued to show his big game prowess by opening the scoring once more against West Germany. Unfortunately for him and the rest of the Dutch, they lost to their bitter rivals 2-1. Francisco Aramburu, better known as Chico, was part of the great Vasco de Gama team of 1947-52. Known as the Victory Express due to five title wins, Vasco had the lightning quick Chico up front (wide left) forming a deadly partnership with national team mate Ademir. And it was the Vasco pair that would dominate the Final Group stages of the 1950 World Cup. Brazil walked through the first group stage, undefeated and scoring 8 goals along the way. And things would get better. Chico scored a brace in a 7-1 demolition of Sweden, and repeated the trick in the next game - a 6-1 trouncing of Spain. Going into the final group game, in what was essentially the World Cup final, Uruguay had only drawn with Spain, and snuck past Sweden with an 85th minute winner. Brazil were heavy favourites, with the media claiming a victory on front pages of that day’s newspapers. People were having street parties in anticipation of Brazil’s first World Cup. But Uruguay had other ideas. In front of a world record crowd at the Maracana (200,000+), it wasn’t to be Chico’s time, nor Ademir’s for that matter. In a game that would go on to be known as the Maracanazo (the Maracana Blow), Uruguay run out 2-1 winners with neither of the prolific Vasco boys on the scoresheet. No pressure for 2014 then…. If you think about early Swedes in Serie A, then it’s more than likely that you think of Gre-No-Li, the AC Milan trio of the 1950s. That however, would be doing a disservice to Kurt Hamrin. The lightning fast winger had a pretty impressive career in Italy with Juve, Padova, AC Milan, Napoli and above all, Fiorentina. He scored over 150 goals for the Viola including goals in the final of the European Cup winners cup in both 1961 and 1962 (beating Rangers and losing to Atleti). In fact that seemed to be his favoured competition as he also scored a final brace for AC Milan in 1968′s 2-0 win over Hamburg – only Milan’s second European trophy. To cap things off from a big game perspective, he also scored the decisive goal in the European Cup semi final in 1969 to knock out holders Manchester United, on the way to lifting the trophy. And for his country he also performed well in the 1958 World Cup on home soil – scoring in the semi final against West Germany. 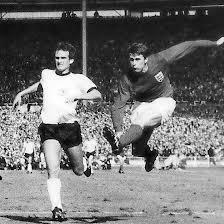 The only entry that scored all of his points in one game, (Sir) Geoff Hurst is known the world wide as being the only man to score a hat trick in the biggest of all games – the World Cup Final. Not just that, but it was also a perfect hat trick. Bouyed by the home Wembley crowd, Hurst and his West Ham England team mates won the nation’s only trophy (excluding 1997′s famous Le Tournoi). And yet it was almost so different for Geoff. If it wasn’t for the last minute equaliser by Wolfgang Weber for West Germany then Martin Peters would have been the match winner after his 78th minute goal. In fact, had it not been for injury, Jimmy Greaves would have been England’s centre forward for the latter stages of the tournament. It’s a funny old game. Its easy to forget that Hurst’s England career aside from the 1966 World Cup (where he also scored the winner in the quarter final) was pretty good – 24 goals in 49 games. Just to prove that ol’ Geoff wasn’t a one game wonder, he also scored in the 1964 FA Cup final for the Hammers. To give a rough idea of just what a great Goalscorer Kocsis was, there’s a few stats that tell the story. He was the first man to score two hat tricks in one World Cup. His strike rate of 1.1 goals per game for Hungary is the best in the history of international football for those with 43 caps or more. And lastly, he was the highest scorer in the top leagues of world football in both 1951 and 1952. Prolific doesn’t really do him justice. Yet the 1954 World Cup was a bittersweet experience for him and the magic Magyars. Whilst he scored a massive 11 goals in 5 games, the only game he failed to score in was against Germany in the Final. A team they’d beaten 8-3 in the earlier rounds defied the odds and the Olympic Champions, unbeaten in competitive games for four years, lost at the worst time. By 1958, Kocsis was at Barcelona, trying to counter Puskas’ influence at rivals Madrid. The European Cup would elude them until 1992 but the Hungarian striker did score in the 1960 semi final and again a year later as well as scoring in the 1961 Final defeat to Benfica. Litmanen diminutive? Since when is six foot small? Jan - I stand corrected! I was sure he was around 5ft 8in - but a quick check shows him to be 6ft! I'm very surprised having watched him for years. Maybe it's because his style of play was typical of the smaller number 10.